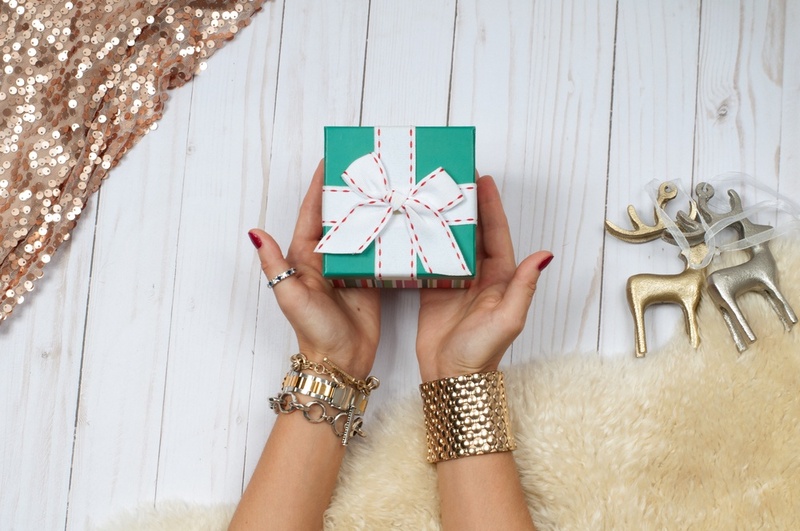 Diamond earrings make the best gift for the holidays. But these must-have earrings don’t have to be large to make a statement. In fact, subtly styled earrings are always on-trend, and small diamond earrings create a dazzling, but delicate, accent to any outfit in her wardrobe. But what type of diamond earrings should you buy? When shopping for small diamond earrings, the choices are numerous; you can select small diamond hoop earrings or small diamond stud earrings. And diamond accents can come in different shapes, colors, and settings. Here’s the stunning scoop on how to buy small diamond earrings this holiday…or anytime! Hoop earrings are en vogue and the bigger the better! But adding diamond details to those dangling circles allows you to mix a hot trend with timeless sophistication. Small diamond hoop earrings come in different sizes and styles. Huggie diamond hoop earrings are smaller and are made to be worn close to the earlobe—thus, the name “huggie.” The size of the hoop on huggie earrings may be small, but buyers can still choose the carat weight of their diamonds. 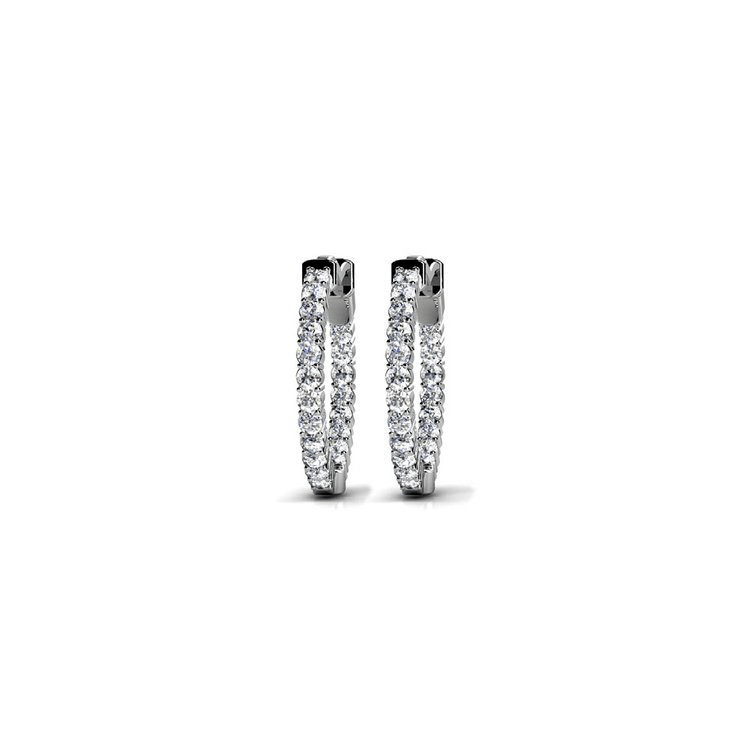 With smaller hoops, smaller diamonds may look best on these earrings. For a minimalist style, opt for a total carat weight of less than a half carat. 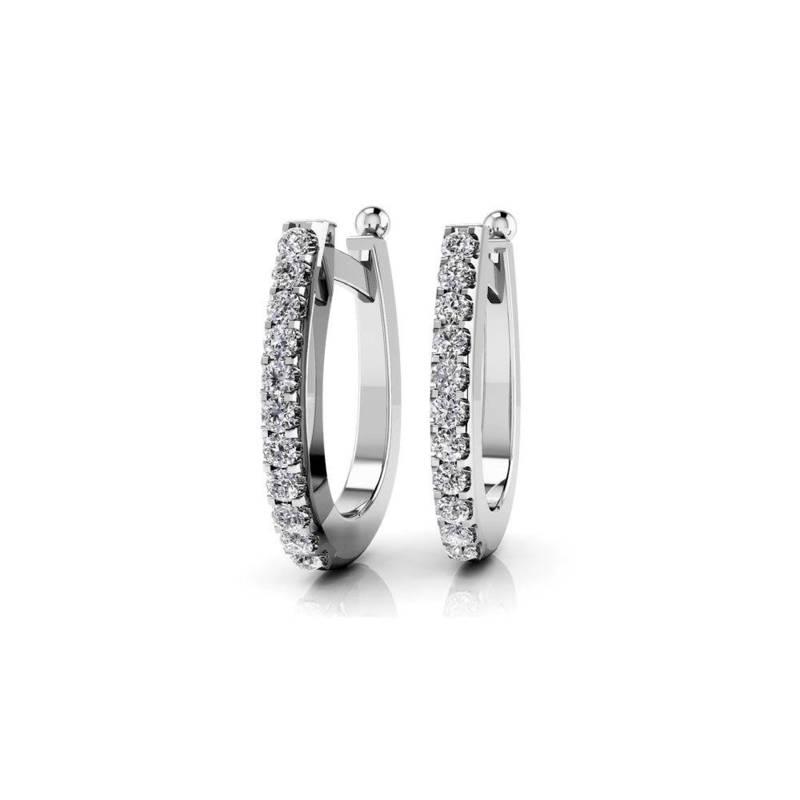 Inside-out diamond hoops include diamonds on both the outside and inside of the hoop setting. This creates a unique design and also allows for more sparkle. This earring design is timeless, traditional and a perfect choice if you aren’t sure what style she loves. U-prong diamond hoops are styled with prongs that resemble horseshoes; these prongs add a unique geometric appeal to the earring. The bigger (or longer) the hoop design, the smaller the diamond may appear on the earrings. If you choose a shorter or smaller hoop but want a delicate style, then select smaller diamond carat weights (under a half carat). Channel set hoops feature diamonds that are nudged together for a seamless line of fire. Again, for a delicate design, choose smaller carat weights for this setting. Diamond studs are timeless and a must-have. You can wear small diamond stud earrings in multiple ear piercings for a duo, trio or quartet of sparkle. So what carat weight is ideal for small diamond stud earrings? Again, less than a half carat is ideal for those who prefer dainty details. 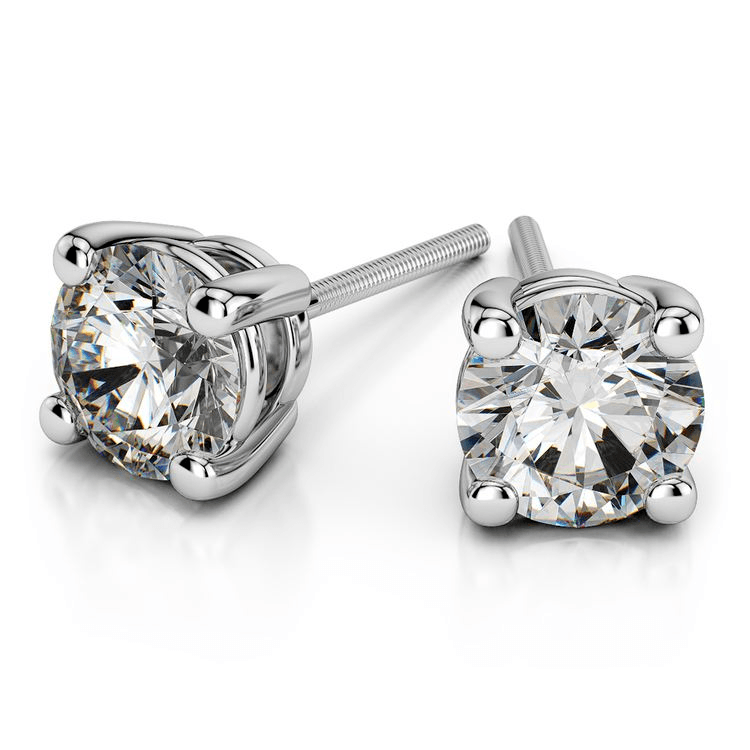 With small diamond stud earrings, buyers have the option to choose their diamond shape. This allows for the earrings to be styled to the wearer’s personality. For a whimsical style, opt for fancy shapes like marquise, pair, or heart. Traditional shapes include round brilliant, princess, and oval. For a vintage inspiration, select shapes like Asscher, cushion, and emerald. Buyers can also select diamonds in fancy hues (including pink, green or canary yellow) for their perfect set of colorful small diamond stud earrings. Diamonds are expensive because they are the rarest gemstone. However, selecting small diamond earrings allows a buyer to have more budget-friendly options. As a diamond’s carat weight is one of the 4Cs of diamond grading, this important C highly affects the price. Large diamonds are extremely expensive because a large diamond is incredibly rare. Smaller carat weights, however, are not as difficult to uncover. Small diamond earrings will still range in price, however. Small diamond hoop earrings may be more expensive than small diamond studs, as hoop earring feature more metal…and more diamonds. Half carat diamond earrings in 18 karat white gold cost around $750. However, huggie diamond earrings with one-eighth carats of diamonds are priced under $600. Small diamond stud earrings vary in price by shape, clarity, and carat. Round brilliant diamond stud earrings measuring a half carat and graded an I1 clarity are the most budget-friendly earrings at about $525. However, princess shaped diamond stud earrings of the same carat weight and clarity are priced at $572. Diamond stud earrings with a better clarity grade will increase in price; metal type also will affect the price (platinum, for example, is the most expensive metal). And unique shapes like Asscher will also command higher prices for even smaller carat weights. Diamond earrings are a wardrobe must-have. Whether you choose to gift her with small diamond hoop earrings or small diamond studs, these accessories can be worn over and over again for decades. For many families, diamond earrings also become heirloom pieces that are handed down from generation to generation. If you’re on the hunt for the perfect gift for the holidays, a birthday or just “because,” choose small diamond earrings for a simply perfect present that she will adore.